Registration fee will be waived for George School students, faculty, and staff members. Please leave a comment in your registration if this applies to you. 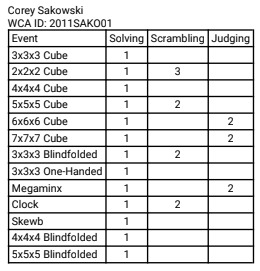 Clock and skewb finals will only be held if time permits. You are viewing the schedule for the venue George School. The Fitness and Athletics Center is located south of the central campus. Please follow the "Admissions" sign and enter through Farm Dr. Parking is available in the FAC parking lot, in front of the venue. Additional parking is available if FAC lot is filled up. Summit Square is available with many restaurants right across Newtown-Langhorne Rd (via Drayton Cir). The walk usually takes 5 to 10 minutes. As the competitor limit has been reached, we will be creating a waitlist for those intending to compete but was unable to be accomodated in said limit. If a confirmed competitor decides to cancel their registration, we will accept waitlisted competitors ranked according to payment time. Note: Your registration will NOT be complete until you have paid the registration fee or have it waived (for GS students and faculty). You will NOT be placed on the waitlist if your registration is incomplete. Many thanks to TheCubicle for sponsoring this competition!